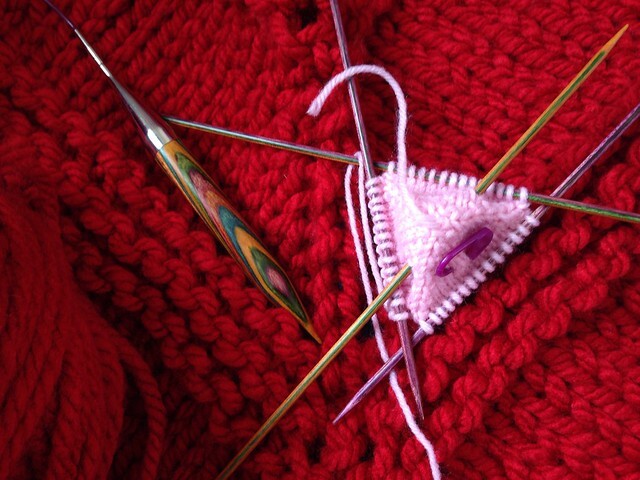 So I finally got around to some much-needed knitting. In fact I've been working on two new and very different patterns. One is the enormous triangular shawl I started-but-didn't-finish for Unravel, now in its third incarnation, and much more 'me' - simple, squidgy and very wide! The other is a fun little spring project which includes some up-cycling. I am hoping to get them both finished before the end of the week, so you should be seeing them soon. 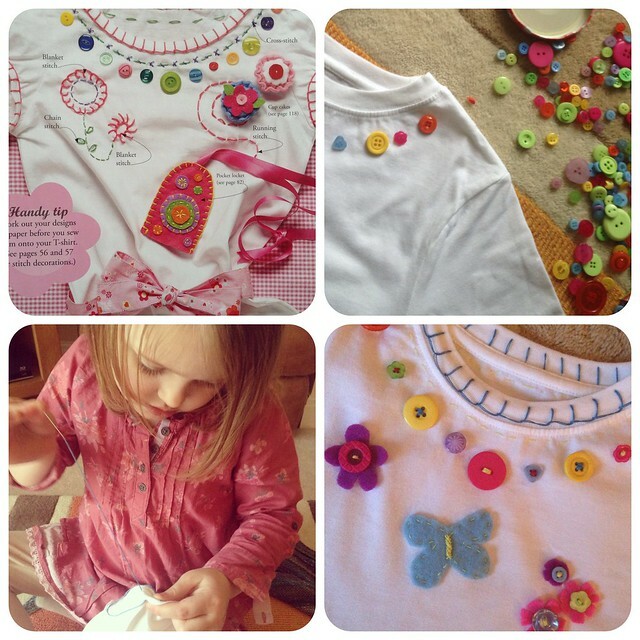 There's also the 'Spring' T-shirt I've been working on with Little Miss, which I mentioned a few days ago. She can't wait to wear it, along with her temporary mermaid hair which is already done. She is sleeping on it right now so I hope it doesn't rub out before the morning! There has been little time to read this week, and I'm very behind with book updates but in brief I've finished, Sisterland (loved it), The Courage Tree (not my type of book, in fact I'm not sure how it was even on my Kindle!) 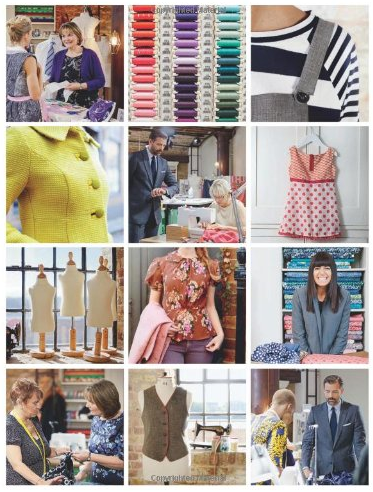 and Apple Tree Yard (really rather good), plus I got my hands on a review copy of The Great British Sewing Bee: Sew Your Own Wardrobe. I can't talk about that without first mentioning this week's episode which was, for me, the best yet. Another cameo from my kids (and me) and lots of laughs while watching my comedy-mum, Lynda, who made some great leggings and then sat drinking tea and eating chocolate while the other sewers could be seen in the background, frantically trying to finish on time. It was very funny! I know a lot of people watch the show on iPlayer (some episodes are on YouTube and I guess international viewers may be watching it there) so I don't want to give away too much or tell you who left, but will say that there were some lovely wrap dresses, including another stunning pattern-less creation from Chinelo and my mum's dress ... which is in the book. In total there are 25 patterns for men, women and children with the aim of creating a capsule wardrobe, and this year I'm pleased to see the women's sizes range from 8-18, an improvement on the book which accompanied the first series, as I'd read a number of disappointed people on that last year. Projects and masterclass notes are split into three sections - fabric, fit and finish - with lots of information on each. This book is very much written with new sewers in mind and if you haven't followed a pattern before (or maybe like me, it was over 20 years since you did!) you can check what the symbols mean, how to make adjustments and take measurement properly for an accurate fit. As you know, I'm not a sewer, but there are some nice patterns in here I would definitely consider trying, especially as my mum is keen to pass on her skills - I'd be silly not to. You may see them here soon! The shot of your Mum with the choccie biccie was comedy gold while everyone else was flapping. Loving the Sewing Bee this year. I will check to see if your mum's season is on Hulu. I'm curious about how this show works. She is definitely representin' the Kit Kat jingle of, "Gimme a break. Give me a break. Gimme a break with that Kit Kat bar." I laughed out loud in several places but that cool calm cuppa will keep me giggling for weeks. How wonderful! I think your mum is great and feel as though I knpw her a little already from reading your blog. She was so relaxed with her cuppa and Kitkat while everyone else was frantically trying to finish. It was very amusing. Oh yes your mum did make me laugh when she was drinking coffee and eating the biscuit, how cool was that! Lol Mmmm I am thinking your mum will certainly get to the final but that dress Chinelo made without a pattern was amazing. The competition is hotting up, cant wait until the next one this week. Is there a pattern for the multi-coloured scarf your mum was wearing in one of the episodes of Sewing Bee?